The massive volcano, glaciers and forests of Mt Rainier just outside of Seattle is one of America’s oldest National Parks, established in 1899. Since then the Seattle megalopolis has grown closer and closer until now Mt Rainier National Park is only a couple hour drive from the urban sprawl of Seattle. But wilderness it is and besides its glaciers and canyons, it is known for its abundant wildlife – including bears. 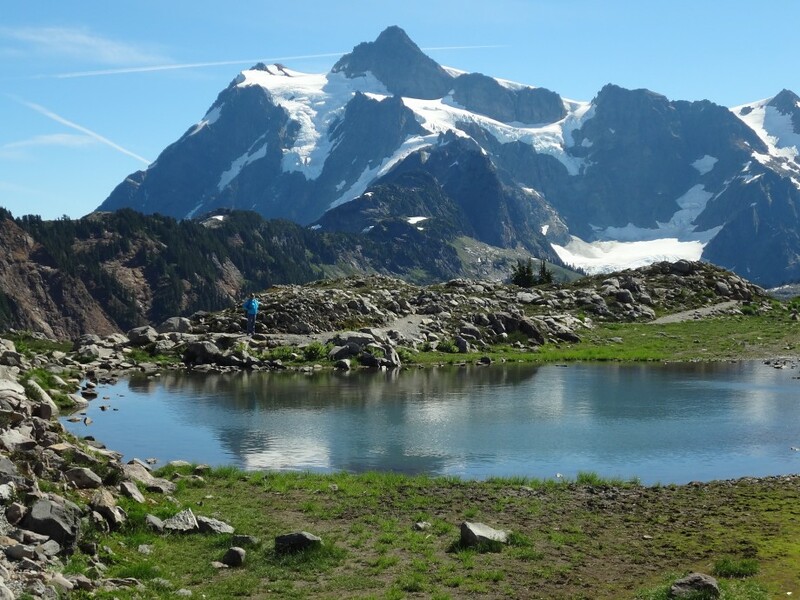 My partners Matt and John and I had been wanting to backpack into Indian Bar, a large meadowland just below the glaciers and along the Wonderland Trail that circles around The Mountain. So we obtained our wilderness passes from the national park ranger station at the Ohanepecosh entrance into the park and drove to the trailhead. The weather was iffy, clouds alternately lifting and then settling back into the valleys and a heavy mist blowing through the forests. But the weather reports forecasted improving weather, so we went for it. The trail to Indian Bar starts off easy, through deep virgin forests, then steeper as it steadily rises into open meadows and rock. As we crossed the Cowlitz Divide long views of valleys and subordinate peaks of Mt Rainier came into sight. Finally, about seven miles from the trailhead we came around a small peak to see Indian Bar below us. With hanging glaciers above it, the mist swirling through the forests around it, the vibrantly green meadows in the middle, it looked like one of those National Geographic photos of southern China or Tibet, a remote oasis amidst the cold, rocky mountains, . . . a Shangri La. 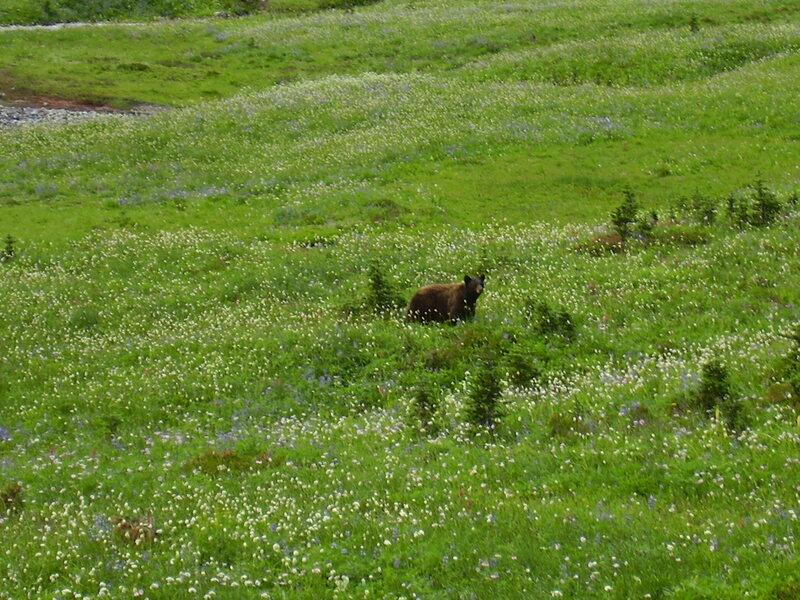 As we dropped into the meadow we noticed something moving around in the middle of it – a bear! (There are no grizzly bears in Mt Rainier, only black bears, but they grow to large size as they aren’t hunted within the park). We entered the forest surrounding the meadow and emerged on the other side, quietly hiking to a flat campsite twenty feet above the meadow with a full view of it. As we set up our tents we watched the bear grazing in the flower-fields about 100 meters away. Finally he ambled off into the forest away from our camp and we went about camp business, preparing dinner, rolling out sleeping gear and preparing for a relaxing evening. We had the whole area to ourselves except for two women camping some distance away from us. As the afternoon wore on another bear, this one cinnamon brown with two cubs, came into the meadow and began grazing as the first one had. We watched her and her cubs and noticed they were actually eating small, white flowers, not digging roots or foraging through logs for insects or rodents. This bear family soon moved on into the forest and the meadow fell silent and still. An hour later another, darker colored bear arrived from the opposite side of the meadow, this one with three cubs. By now we were amazed. We’ve all seen many bears during our time in the outback, but never so many in so small an area and in so short a time. This family grazed their way towards us until barely 25 meters away at which time we quietly abandoned our camp, snapping photos as we backed away from the approaching bears. But she turned at the small bluff just below our campsite, climbed the embankment not 15 meters from our tents, and led her family off towards the women’s camp. I quietly hiked to their camp to warn them and soon saw the bear family silently passing through the forest 50 meters away. So, that’s eight bears in four or five hours so far. Maybe one was a repeat, but I don’t think so as they were of different sizes and shades of brown. The single bears were easily distinguishable and the families were in distinct groups of three or four. Now it was gathering dusk so the show is probably over. But wait! A large, almost black male appeared on the edge of the forest and walked into the meadow, grazing on the flowers as the others had been doing. He was conspicuously larger, the biggest bear we’d seen so far, and darker than the others. He waded through the flowers into the center of the meadow, grazing as he went, until he too slowly walked off into the forest in the opposite direction of the family of four. Needless to say that night we made good use of the “bear pole” provided in the camping area to hang our food out of reach of our furry friends. The next day, dawn broke foggy and cold and not a bear to be seen. 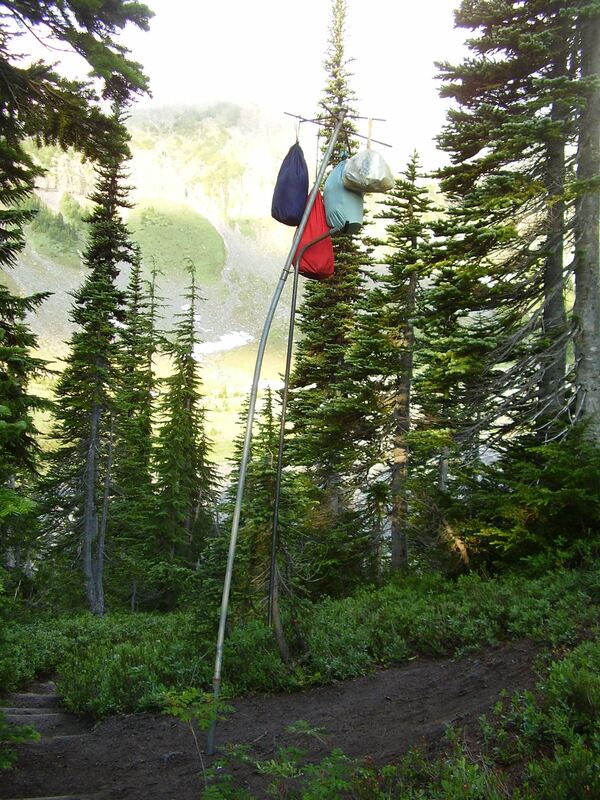 We had our breakfast, prepared our day packs with lunch and raingear, hung our food, toothpaste and toiletries on the bear pole (bears love toothpaste) and started off for Panhandle Gap, a rocky pass between Indian Bar and Summerland, another park-like group of meadows along the Wonderland Trail. We crossed Panhandle Gap in a thick fog, descended through snow fields to Summerland and were shocked to find the meadows there full of tourists in floppy straw hats and flowered shirts. Summerland is only a 3 ½ mile hike from the White River Road to the north and this group was a busload of Japanese tourists that had hiked here from the road. I admired their willingness to hike the steep trail, but the noisy crowds were unnerving after the silence of Indian Bar. To add to the hubbub some unusually aggressive “camp robbers” (Canadian Jays – grey, robin-size birds) flew in and started pecking the sandwiches right out of our hands until we shooed them away. Then they tried to open our packs, flying close by our heads to encourage us to feed them. Still, we enjoyed watching the marmots lounging on the rocks in the meadow until a coyote suddenly trotted out of the brush, 75 meters away and across a shallow gully from us. Without delay he pounced on one of the sleeping marmots and as the crowd oohed and awed, cameras clicking away, he ripped the marmot limb from limb, eviscerated it, and feasted on the bloody entrails. Many of the tourists thought it was a wolf, and who am I to say otherwise, so we silently watched the spectacle with everyone else. Mr. Coyote finished his meal in what seemed to be just five minutes or so and muzzle red with blood trotted off back into the brush. This trip was turning out to be a wildlife extravaganza, but the crowds at Summerland were too much for us so we started back up towards the snow fields of Panhandle Gap and home at Indian Bar. As we reached the bare rock above Summerland we saw another coyote, this one chasing a small herd of mountain goats across a snow field above us. There were five goats; a mother with three kids and a large billy in the lead. Now we’ve also seen many coyotes in our travels, but never one hunting a herd of animals on its own. The coyote was relentless, but as he closed in on the group, focusing on one of the kids, the billy turned and faced him down and the coyote wisely fell back. The goats then retreated over a rise above Panhandle Gap while the coyote followed, but at a distance now and it appeared to me, somewhat disheartened. As we returned to our meadow at Indian Bar the large dark-colored male bear was grazing at the far end of it. By the time we reached our campsite he had moved across the meadow and soon ambled away to the south. That was our last bear sighting of the trip. We had a hearty dinner, sipped our whiskey, and congratulated ourselves on an excellent trip. Next day, up early and out but tonight – don’t forget to hang the food!